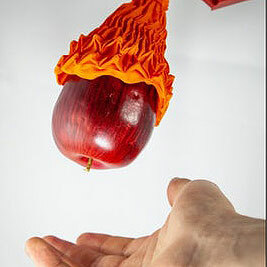 The soft Magic Ball robotic gripper from MIT takes its inspiration from origami to gently lift objects much heavier than itself. The gripper takes advantage of the team’s earlier work with FOAM, and features a cone-shaped origami structure surrounded by an airtight skin and attached to a vacuum pump. The cone will flex to fit over an object, after which the vacuum will apply negative pressure, causing the cone to tighten around the item. In tests, the Magic Ball gripper was able to lift a variety of objects up to 100 times the device’s own weight and in an array of different shapes, which could be particularly useful in packing and loading objects.